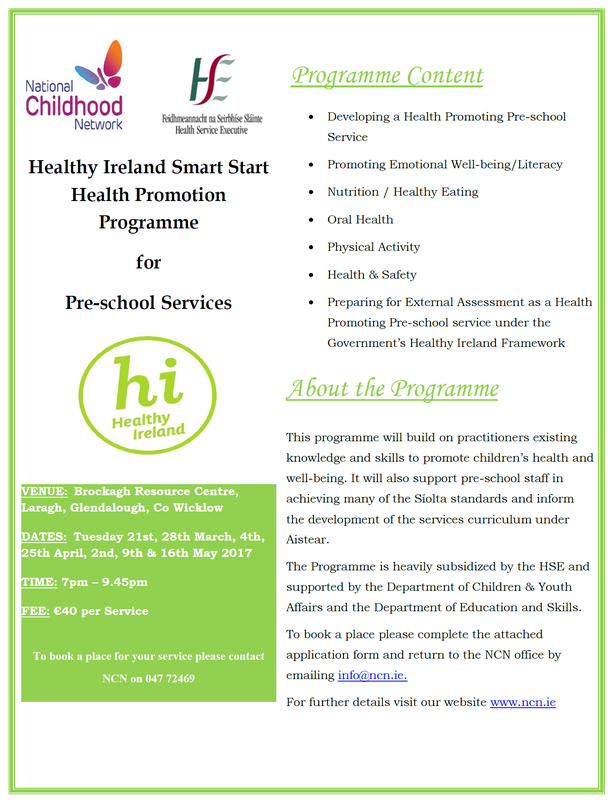 Pre-school Providers and staff are invited to participate in the Healthy Ireland Smart Start Training Programme. This programme provides the information, training, resources and guidance required to become officially recognised as a health promoting pre-school service by the HSE. The training will be delivered one evening per week over 7 consecutive weeks in the Brockagh Resource Centre, commencing Tuesday 21st March 2017. The programme builds on and enhances staff’s existing knowledge and skills in promoting children’s holistic development. It also builds on other health promoting initiatives pre-school staff may have previously engaged in.